To get ahead, surveyors require business and managerial acumen as well as technical skills. Business Skills for Surveyors explains how the property market works, how investors and developers make their money, and how business objectives interrelate with property strategies. Economic, financial market and accounting issues are explained, and guidance is provided on negotiation skills, presentation technique and other ways to accelerate personal development. 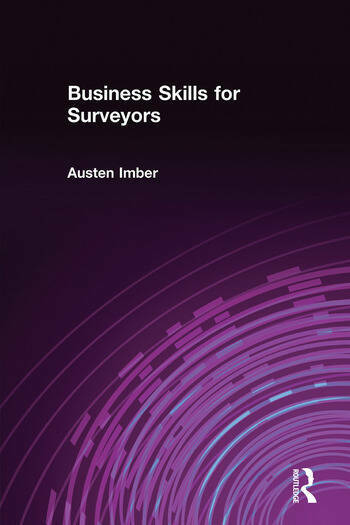 The book is suitable for younger surveyors seeking to develop business skills, and for any surveyors looking to get the best out of their business and themselves. Austen Imber combines surveying with business and training consultancy to companies in the property sector. Clients range from international property consultancies, government agencies, and corporates, to small surveying businesses and individual surveyors. Austen is a former director of a small plc property investment company, and also runs his own consultancy.